AzhwAr says that emperumAn, who is like this, gives whatever is asked of to those who ask for them. He says that emperumAn’s possessions are all only for others. uNdavanE – Oh one who ate and reclined! mAlavanE – Oh the great one! meymmaiyE – AzhwAr says that truly there was no fault in this activity. Unlike clairvoyants who carry out some magical acts [with the sleight of their hands], did not emperumAn truly carry out this deed [of keeping the worlds in his divine stomach]! 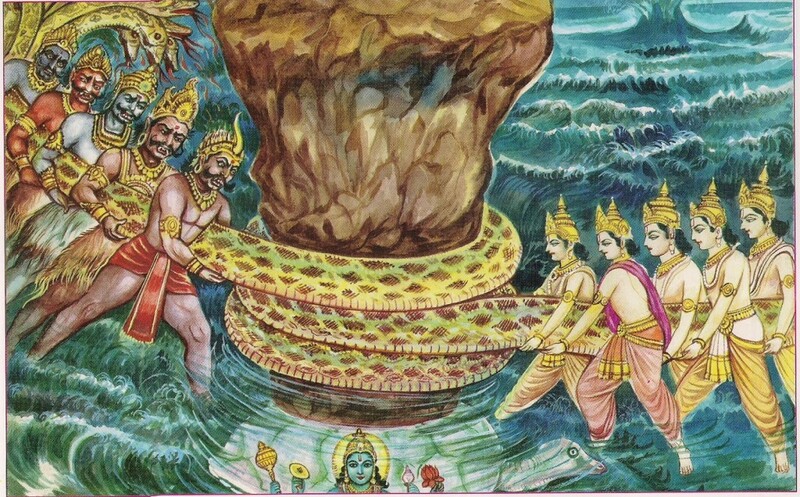 mandharaththAL mA nIr kadal kadaindhu – churning the huge ocean with the [celestial] mountain manthara as the staff. vAn amudham – the potent nectar; in other words, the nectar which has the power to provide permanency to the physical form; the nectar which would give life to dhEvas (celestial entities) so that they would not face old age, death etc. andharaththArkku IndhAy nI anRu – you gave nectar to dhEvas who dwell in suvargam (heaven). 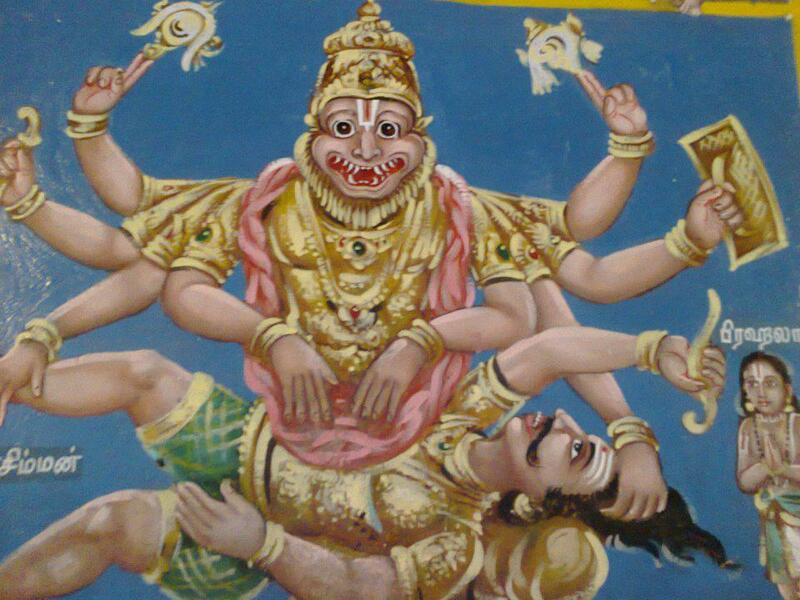 dhEvas are referred to as andharaththAr since they are neither in samsAram which is down below nor in SrivaikuNtam which is far above, but somewhere in between the two, like a loft for samsAram fastening themselves to samsAram (remaining in samsAram by taking nectar, without having to face death). meymmaiyE – AzhwAr is amazed that emperumAn truly swallowed the worlds during the time of deluge, protecting them, and churned the oceans to offer nectar to dhEvas, without any trace of magic. We will take up the 34th pAsuram next. This entry was posted in iyaRpA, mUnRAm thiruvandhAdhi on March 31, 2018 by T N Krishnan. AzhwAr says that there is no limit to the divine abodes where emperumAn, who is this simple, has taken residence. nURkadalaum – the sea of knowledge. The sea of ithihAsa (great epics such as SrI rAmAyaNa and mahAbhAratha) and purANas (ancient literature describing emperumAn). nuN nUla thAmarai mElpAl pattirundhAr manamum – Just as it is mentioned in thaiththirIya upanishath nArAyaNavalli “padhmakOSaprathIkASam hrudhaynchApyadhOmukham” (heart which is like the inverted lotus) the hearts of those who know that emperumAn resides in the lotus-like hearts of people, as known only from SAsthras. The hearts of yOgis who focus their sensory perceptions on the place revealed by SAsthras as lotus-like heart. idamAgak koNdAn – one who has these places as his dwelling abode. kurundhu osiththa gOpAlagan – kaNNan (krishNa) who has the characteristic of destroying enemies. AzhwAr is amazed that emperumAn, who has such greatness, appears as such a simple entity to him. We will move on to the 33rd pAsuram next. This entry was posted in iyaRpA, mUnRAm thiruvandhAdhi on March 30, 2018 by T N Krishnan. 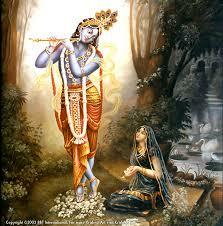 yaSOdhA showered affection on krishNa since he was near her. When we say the he is not near us now, AzhwAr gives the names of divine abodes where he has taken residence. He mercifully states that emperumAn, who was simplicity personified for one person (yaSOdhA) at one point of time, is now simplicity personified for all people at all times by taking residence in many divine abodes. nErndha en sindhai – my heart which is not that great [as the divine abodes mentioned above]. Since AzhwAr says nErndha en sindhai the reason for taking residence in all these divine abodes is only to enter his heart. 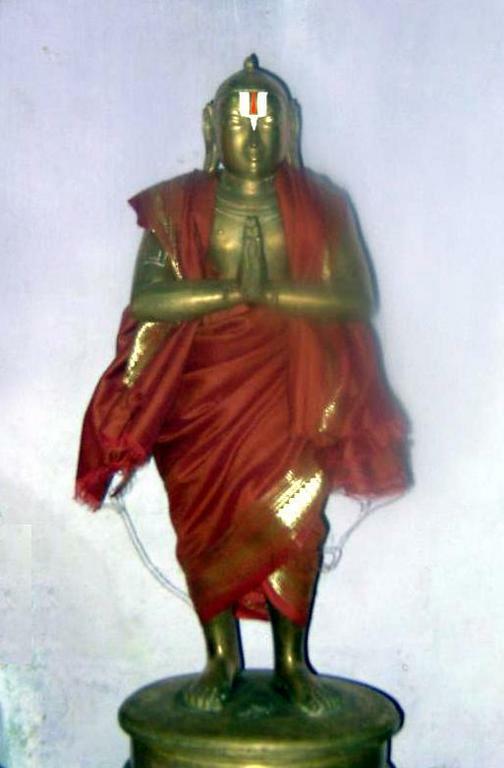 vAyndha maRai – the vEdhas (sacred texts) which describe him as he is. Thus, to AzhwAr, emperumAn taking residence in divine abodes explicitly and standing firmly in vEdhas appear with equal radiance, without any difference. ivai – AzhwAr says that these are the places where emperumAn has taken residence. vaN thuzhAyk kaNNi could also be considered as a place where he has taken residence. Or it can taken as an adjective for emperumAn and consider the meaning as: emperumAn who has adorned the beautiful thuLasi garland has taken residence in these places. 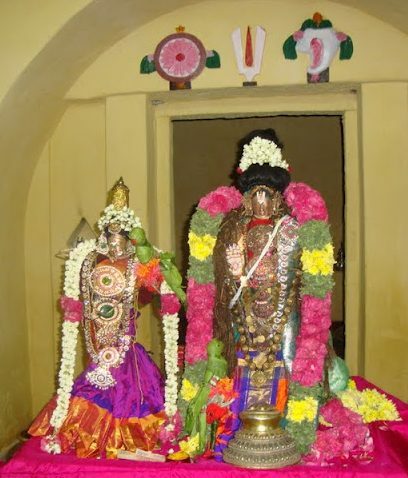 Once he mentioned about yaSOdhAp pirAtti, AzhwAr remembers of her affection for kaNNan (krishNa) and her qualities and says that she is unique. In the previous pAsuram had he not said “udaindhadhuvum AychchippAl maththukku”? Just as there is none to equal him in being afraid of yaSOdhA, he says that there is none to equal yaSOdhA in showering affection. In the previous pAsuram he had said “midaindhadhu bAradha vempOr”. Just as emperumAn transformed himself for the same of his followers, he says in this pAsuram yaSOdhA transformed herself for his sake. For a woman, being afraid of is a natural characteristic. For yaSOdhA, being without fear is transforming herself and it is this which she did, he says. pEychchi pAL uNda perumAnai – killing pUthanA after drinking milk from her poisoned bosom. Due to this, he protected himself and gave himself to the world. Has it not been mentioned in harivamsam “sthanyam thath vishasammiSram rasyamAsIth jagathgurO:” (her breast-milk which was poisoned, was very sweet for him)! There is none in the world to equal him when it comes to escaping death. perumAnai – he re-established his quality of SEshi (being the Lord). When events such as pralayam (deluge) take place, we can remain unperturbed since he is there to take care of. Did not danger come to him (due to pUthanA)? 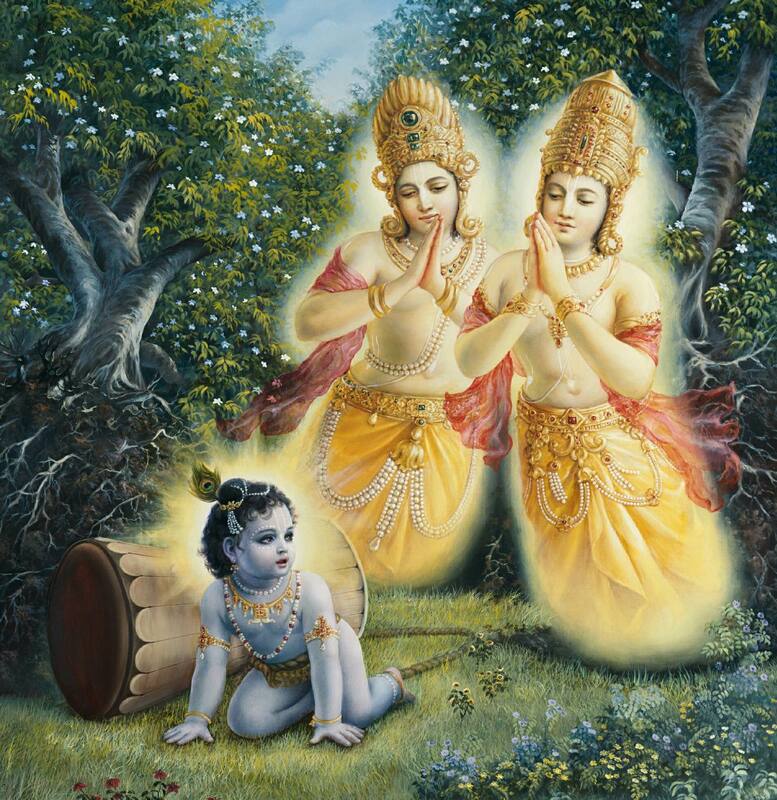 pErndheduththu Aychchi mulai koduththAL anjAdhE – wouldn’t the mother become fearful once she comes to know that krishNa has been captured by pUthanA! But, leaving aside the quality of fear which is natural for women, yaSOdhA rushed to him and tried to give him antidote. 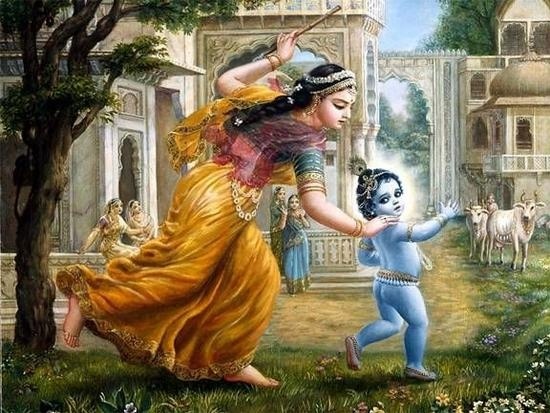 Instead of swooning on hearing that krishNa has been taken away by pUthanA, yaSOdhA came walking to the place where krishNa was, lifted him up and started nursing him. Swooning is an act of affection only. However, shouldn’t one take the initiatives to get back krishNa! Did not AzhwArs, who were blessed with knowledge sans any ignorance, engage in the activity of madalUrdhal (an act in which the person sits on a horse made of palmyra leaves and requests the townspeople to unite him/her with his/her beloved) knowing full well their as well as emperumAn’s nature! This (act of yaSOdhA) is similar to that. vAyththa iruLAr thirumEni – AzhwAr describes the radiance in the divine form of krishNa as he sat on pUthanA’s lap to drink her milk. 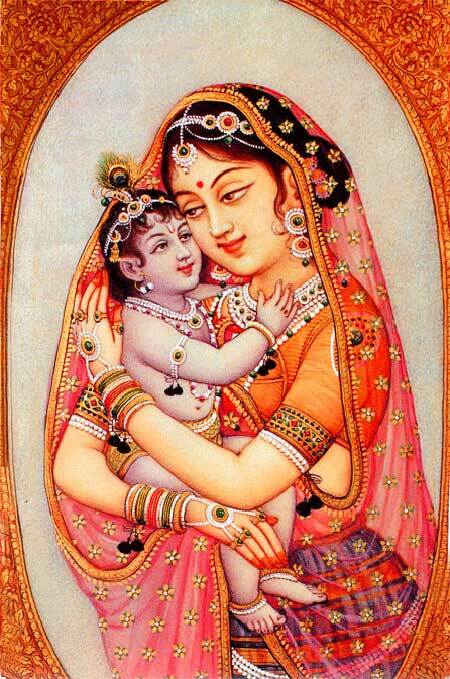 Wasn’t this beauty the reason for yaSOdhA to shun looking after herself and lift krishNa, falling head over heels! in pavaLach chevvAy – emperumAn has divine lips similar to coral. He smiled when he was suckling from pUthanA just as he smiled when suckling from yaSOdhA. vAyththa iruLAr thirumEni – he has a divine form which will remove fatigue. mulai koduththAL – for such krishNa, yaSOdhA transformed herself and suckled him. We will take up 30th pAsuram, next. This entry was posted in iyaRpA, mUnRAm thiruvandhAdhi on March 27, 2018 by T N Krishnan. AzhwAr says that those who attained emperumAn will experience the result of their misdeeds on the day when the pANdavas kill their adversaries themselves [without seeking krishNa’s help] (in other words, this will not happen at all). In continuation of the earlier pAsuram when AzhwAr had mentioned about divine abodes “vEngadamum vehkAvum vELukkaippAdiyumE”, he mentions about how emperumAn is subservient to his followers. adaindhadhu aravaNai mEl – emperumAn cannot ignore thiruvananthAzhwAn (AdhiSEshan) who cannot sustain himself without emperumAn. Hence he reclines on him. aivarkkAy anRu midaindhadhu bAradha vem pOr – for the sake of his followers, emperumAn even transformed himself. For the sake of pANdavas, he conducted the rigorous mahAbhAratha war. By these two lines, it is opined here that emperumAn will give his own divine form as he gave to AdhiSEshan and transform his divine form, as he did in the case of pANdavas. AzhwAr says that emperumAn, who has the softness of divine form to recline on AdhiSEshan, conducted the rigorous battle also. midaindhadhu – AzhwAr says that it was emperumAn who conducted the mahAbhAratha battle. The pANdavas were not even the mere reason for it. udaindhadhuvum AychchipAl maththukkE – emperumAn did not fear bhIshma et al; he did not fear their weapons such as brahmAsthra, spear etc. But he was very much afraid of the staff [used for churning curd to get butter] at the hands of yaSOdhA. The one who did not lose to great warriors lost out to yaSOdhA, without any remedy! Fearful of yaSOdhA, he suffered at her hands just as his opponents suffered at his. It appears that if his enemies had dropped their weapons and instead took a staff in their hands, they might have won! When rAvaNa lost his bow, didn’t SrI rAma spare him without killing him, as mentioned in SrI rAmAyaNam yudhdha kANdam 59-130 “chachAla chApancha mumOcha vIra:” (rAvaNa walked unsteadily; he let go of his bow)! vAL eyiRRup pEychchi pAl uNda pirAn – he is the benefactor who destroyed pUthanA who came with teeth which were like swords when he was just an infant. Afraid of yaSOdhA who was very much favourable to him, he did not sever himself from the string with which she had tied him. Is it not amazing that even at that tender age, he had the capability to distinguish between his mother and the demon who came in the form of his mother! What would have happened had you been afraid of pUthanA who came in the form of yaSOdhA? Is it not our fortune that you did not fear her thinking that she is your mother! For the phrase vAL eyiRu we can consider the meaning as pUthana with radiant teeth. AzhwAr expresses his amazement with the word ammanE. We will take up the 29th pAsuram next. This entry was posted in iyaRpA, mUnRAm thiruvandhAdhi on March 26, 2018 by T N Krishnan. AzhwAr is asking whether we have ever heard of anyone suffering due to the sins committed, after attaining emperumAn. If this is the characteristic of emperumAn, is there anything such as someone is experiencing the results of sins, asks AzhwAr. Did not yama (deity of dharma, righteousness) ask a person who was experiencing the results of sinful deeds in hell, “You will go the terrible way! Have you not attempted to attain emperumAn even for one day?”. Did yama not tell a person, as mentioned in SrI vishNu dharmam “kim thvayA nArchithO dhEva: kESava: klESa nASana:” (did you not worship kESava, who removes sufferings?). Had he not said “You will go the terrible way! You did not go the right way! You spoiled yourself!”. Didn’t sIthAp pirAtti tell rAvaNa in SrI rAmAyaNam sundhara kANdam 21-19 “mithramaupayikam karthum rAma: sthAnam parIpsathA, vadham cha anichchathA ghOram thvayA asau purusharshabha: ” (SrI rAma who is the best among all purushas (souls) is the apt person to make friends for you who would like to remain in this world and who would not like to die a horrible death )! Did she not say that he had not attempted to carry out atonement for all the sins that he had committed! nALum thuyar uzhandhAr Ar – who suffered even for one day? thunbu uRRAr ANdaiyAr – where are those who experienced sorrow (like that)? ArE thuyar uzhandhAr thumbuRRAr – who, before this, has suffered the consequences of carrying out sinful deeds which are the reason for sorrow? Are there people who have experienced the result of carrying out lowly deeds? After attaining emperumAn, suffering the results of sins is equivalent to “agnina sinchEth ” (wetting with fire). Who has experienced the consequences of carrying out sins in the past, after attaining emperumAn? Hasn’t emperumAn himself told arjuna in SrI bhagavath gIthA 9-31 “kaunthEya prathijAnIhi na mE bhakthi: praNaSyathi” (my devotee does not get destroyed. Oh arjuna! You take this oath!). When the king of ocean did not pay heed initially to SrI rAma’s request to yield way for going to lankA (to wage war against rAvaNa), SrI rAma prepared to shoot an arrow on him. But when the king of ocean surrendered to him, did not SrI rAma not only not shoot the arrow on him but shoot it against the enemies of the king of ocean! Once a person attains emperumAn, all that remains is experiencing the benefit of that. ANdaiyAr – in which time are those, who did not experience that benefit? kArE malindha karum kadalai – is emperumAn such powerless that his followers have to suffer the consequences of sinful deeds? Is there any suffering for those who attain the omnipotent? Isn’t he the one who churned the ocean which was surrounded by clouds with manthara mountain as the staff! 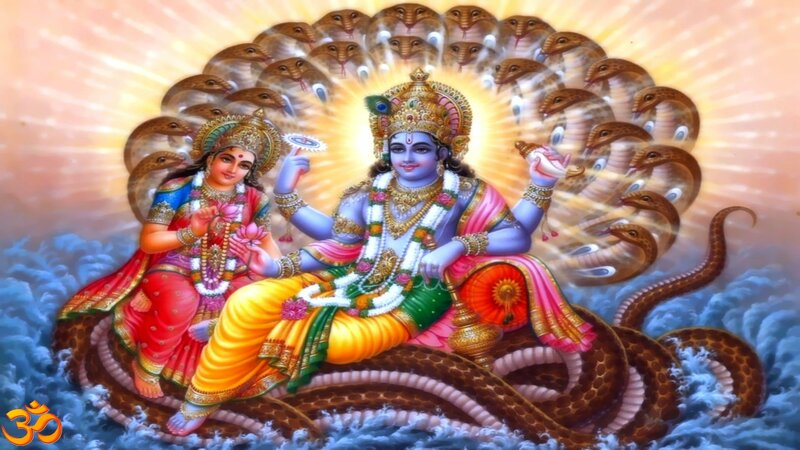 nErE kadaindhAnai – he churned the ocean such that only nectar came out, without disturbing the clouds which had gathered over the ocean. kAraNanai – the causative entity for all the worlds. Am I leaving him because I want to disprove the relationship with him? There is no place to go other than he, who is the cause for the worlds. nIraNai mEl paLLi adaindhAnai – are we suffering because he is not making any effort to protect us? He is reclining in the milky ocean so that he could come near us and carry out our activities since he is the causative factor. nALum adaindhu – have those, who attained him, suffered because they had carried out deeds which would give rise to sorrow? Since attaining him itself is sweet, attaining him every day will give rise to sweetness only. Alternatively, we can consider the meaning for ANdaiyAr as any point of time and nALum as every day and consider the meaning for the verse as those who would not suffer at any point of time or any day. The reason for AzhwAr saying this is the deep belief that he has on emperumAn. An incident which happened in the life of parASara bhattar (son of kUraththAzhwAn) is quoted here. One day, during the uthsavam at the SrIrangam temple, parAsara bhattar was recounting the greatness of periya perumAL (SrI ranganAthan), at a place called thiruvURRangarai. At that time, a disciple of siRiyAththAn came there and told bhattar, “jIyA! (a name by which bhattar was known, which means a knowledgeable/venerable person) All the brAhmaNas have congregated here. This is the time for sandhyAvandhanam (a daily ritual for people from the first three varNas). Come, let us get up and carry out sandhyAvandhanam”. bhattar told him “What have you done? When periya perumAL and the festivities are going on in a grand scale, just because I have not carried out a small task, will yama write it down in his book?”. 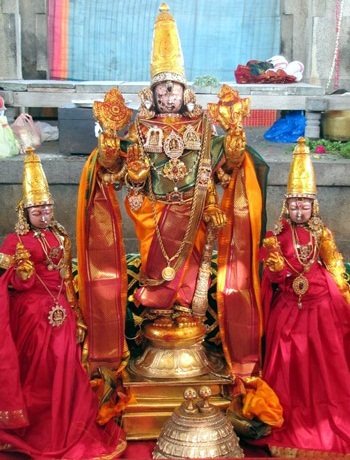 bhattar then went on to mercifully recite the pAsuram “sollAy thirumArbA” from periya thirumozhi 6-3-9 and gave the following explanation: “unakkAgath thoNdu patta nallEnai vinaigaL naliyAmai nambu nambi ” – a king was listening to the names of people who had committed crimes in his kingdom. If the person who is reading out the names, mentions the name of a person who is very close to the king and the king says “let it be so. Go ahead and read the other names”, can that person’s name be read out again? In the same way, if emperumAn has accepted a person, yama et al cannot delve into his misdeeds ever. Thus AzhwAr says that due to any shortcoming in the power of emperumAn or if the relationship between us and emperumAn becomes false, we have to experience the result of our karmas (deeds). In other words, since there is no shortage in emperumAn’s powers to remove our sins and since there is nothing false in our relationship between us and emperumAn, there will be no need to experience the result of our sins. We will take up the 28th pAsuram next. This entry was posted in iyaRpA, mUnRAm thiruvandhAdhi on March 25, 2018 by T N Krishnan. AzhwAr mercifully states how, after he attained emperumAn, he desired AzhwAr’s divine mind more than his divine abodes. The reason for emperumAn taking residence in temples is only to enter the hearts of followers who accept him. Alternatively, we can say that AzhwAr is saying that the benefit that we obtained out of emperumAn eating yaSOdhAp pirAtti’s butter is the simplicity of emperumAn, more than his simplicity in eating butter, by taking residence in divine abodes. Had he not asked “Is there any harm in worshipping?”. After AzhwAr saying this, will emperumAn keep quiet? (he took residence in AzhwAr’s divine heart). siRandha en sindhaiyum sengaN aravum – both these are equal as far as emperumAn’s desire goes. In other words, AzhwAr says that emperumAn considers AzhwAr’s heart to be the exact match for thiruvananthAzhwAn (AdhiSEshan) who is his most desired mattress. sengaN aravum – ananthAzhwAn’s eyes are reddish, like the eyes of those who take intoxicating materials such as honey, because of his connection with emperumAn. uRaindhadhuvum – emperumAn has taken residence in AzhwAr’s divine heart, considering it as his own, just as he has taken residence atop thiruvananthAzhwAn who is his most desired mattress. niRaindha sIr nIL kachchiyuLLum – in divine kachchi which is full of divine abodes of emperumAn and unlimited sweetness. emperumAn will reside continuously at thirukkachchi, thirumalai, thiruvehkA and thiruvELukkai, without ever letting go of them. By considering the verse sequence to be niRaindha sIr nIL kachchiyuLLum uRaindhadhuvum – vEngadamum vehkAvum vELukkaip pAdiyumE thAm kadavAr we can say that emperumAn cannot let go of each of the divine abodes of vEngadam, vehkA and vELukkai and he will reside continuously in these divine abodes and that he resides with lot of desire in the great divine mind of AzhwAr, thiruvananthAzhwAn and the town of thirukkachchi which has many divine abodes. Since the word uRaindhadhuvum (resides) has been used, we can consider it this way. Alternatively, by taking the sequence siRandha en sindhaiyum sengaN aravum thAm kadavAr we can say that emperumAn will not go past AzhwAr’s great divine mind and thiruvananthAzhwAn. niRaindha sIr nIL kachchiyuLLum vEngadamum vehkAvum vELukkaippAdiyumE uRaindhadhuvum will give the meaning that emperumAn merely resided in these places. 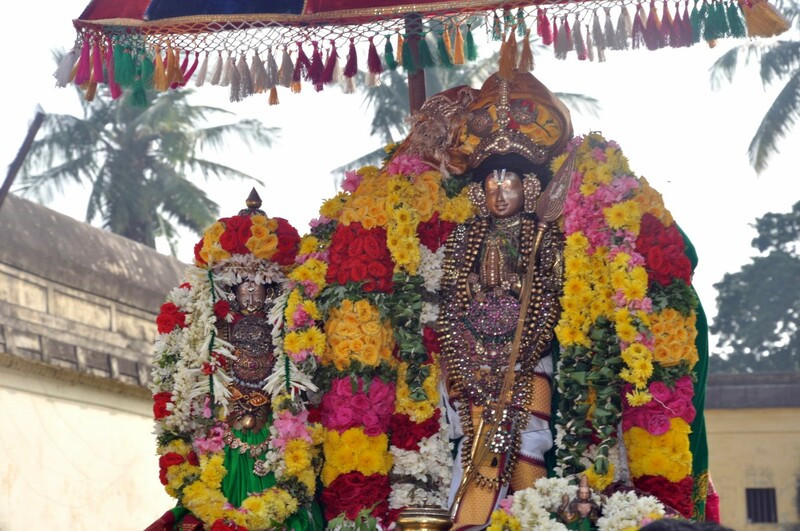 thanduzhAyAr – emperumAn who wears the divine thuLasi garland, taking a vow that he will protect the followers. We will take up the 27th pAsuram next. This entry was posted in iyaRpA, mUnRAm thiruvandhAdhi on March 24, 2018 by T N Krishnan.